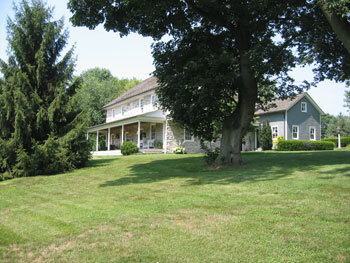 Philip Ferree and his wife, Leah Dubois, built this stone home about 1720. It has been restored and a private residence whose owners operate their home as Ferree House Antiques. Below, the barn and stone fence still on the property. Philip Ferree (1687-1753) and Leah Dubois (1687-1758) were the son and daughter-in-law of Madame Ferree.